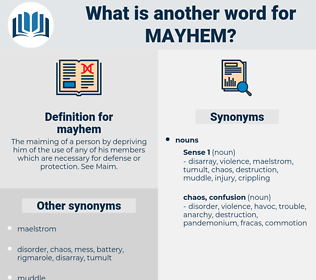 What is another word for mayhem? The maiming of a person by depriving him of the use of any of his members which are necessary for defense or protection. See Maim. lawlessness, destruction, Maiming, slaughter, unrest, damage. 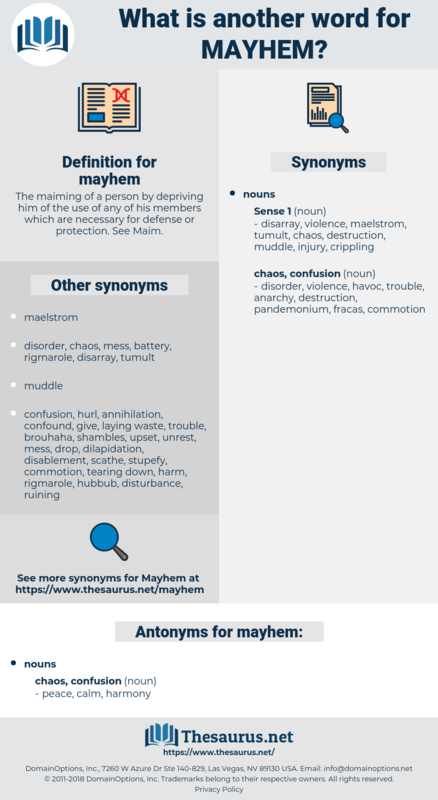 devastation, carnage, mess, shambles, mutilation, disarray, chaos, bloodshed, rampage, pandemonium, upheaval, uproar, disruption. mammy, menomini, ma'am, mammee, mei, miaou, moony, mam, moneyman, muon, mu, mina, mayenne, many an, mao, money, moon, mammea, moon on, mem, mo, men, mayan, mommy, m2, mahayana, mho, maha, mama, mayhaw, many a, mahan, menuhin, moa, min, m-1, myoma, may 1, mono, M.M., meow, momma, mummy, maim, m3, mown, mean, miao, mom, m1, mum, myna, ma, mien, maui, M, mow, mamo, Minyan, mon, mahonia, moan, meany, mynah, mona, minoan, mime, mimeo, maia, mnium, maw, mayo, mm, may wine, moue, minnow, meme, menu, minim, maoi, manna, minimum, manannan, me, memo, mini, 8 May 1945, mya, manama, man, maya, many, mamma, mania, miami, moo, mannheim, may 24, maine, mahimahi, Moonie, mi, moynihan, mine, mammon, meanie, mamey, menominee, mym, mane, mahoe, miaow, may, monoamine, mann, minion, mooneye, main, minium, monomania, mew, Moho, mn, minah, muumuu. law-breaking, crime, criminal offence, criminal offense.